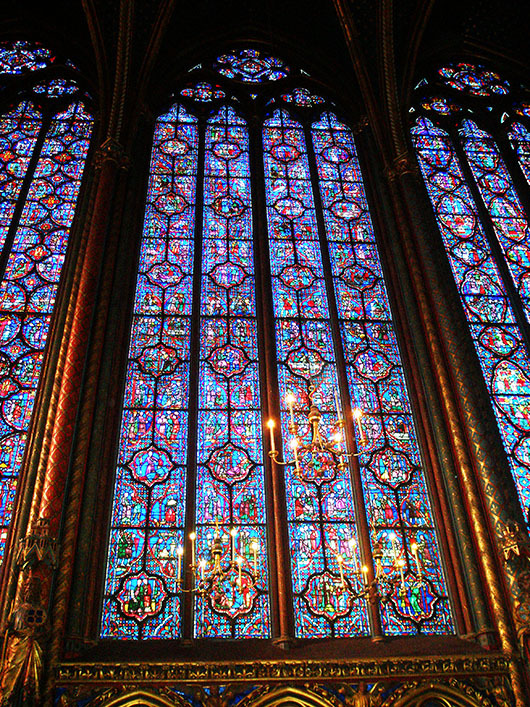 The stained glass windows of Sainte Chapelle on the Île de la Cité in Paris, are jaw dropping splendid! Fifteen such windows surround the nave and apse of the second floor chapel with a huge rose window at the opposite end. Two thirds of the 600 sq meters (6,458 square feet) of glass is supposedly original, making this the most complete surviving example of 12th century glass craftsmanship! An amazing depiction of the story of humanity as told by the old and new testaments, in an incredible play of light and colour! If you know of anyone who has stood on the top of that narrow spiral staircase and not gasped in awe, he/she is certifiably blind. 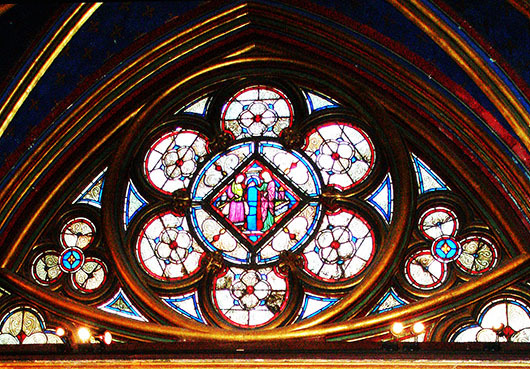 Sainte Chapelle was built in 1248 as a reliquary to house and display a portion of the crown of thorns and a piece of the original cross among other relics, bought by King Louis IX (St. Louis) from the Byzantine emperor, for a price that was reputed to be more than three times the cost of the building!! The chapel suffered damage during the French revolution, and the relics were lost. (The crown of thorns was subsequently recovered and is displayed every Friday in the treasury of the Notre Dame) Thankfully the stained-glass was put in storage when the building was used as an archive and was faithfully restored in the 19th century. Until then….happy travels, no matter where life takes you! Both absolutely splendid! The composition on that second shot is spot on perfect. You are so right about these being jaw-dropping splendid! I am always in awe of the skills which put these magnificent pieces together – the detail, the symmetry and then the light hits those beautiful colours! Lovely shots Madhur! Means a lot coming from you Patti! Thank you very much! Quite splendid indeed; and I love the story about the crown of thorns relic. I assume they still have it? Love to explore churches. You have definitely captured the splendor of this one Madhu! This is the best shot of Sainte Chapelle window I’ve seen! Splendid all the way! You are ever generous Amy 🙂 Thank you! The light, especially in the evening is incredible! Thank you Marina. What a fitting choice, Madhu! I distinctly remember that sense of awe that washed over me when I visited back in 2006… sadly there were no pictures to tell the tale! Amazing wasn’t it? I have just these few pictures too. The panoramic views came out too dark with my point and shoot. Sweet indeed 🙂 Thanks Riba! HI Madhu, nice choice for SPLENDID. St. Chappelle was a standout for me, of all the churches and cathedrals in Paris. The enormity of the windows and the artistry that went into creating them is a testament to a period of “splendor.” This telling of humanity through stained glass was a beautiful choice for splendid and close-up, Madhu. Now I must visit this church. Oh you absolutely must Lynne, and remember to climb upto the second floor 🙂 I know of people who have come away from there thinking it was unremarkable, and it turned out they didn’t go upstairs!! This is really beautiful, Madhu. The colours and their complexity are every bit splendid. I have often wondered what a peasant, coming in in the thirteenth or fourteenth centuries, must have made of these towering buildings. They likely had no idea this existed! Peasants and common folk were restricted to the lower chapel apparently. This one was for the royal family and nobility! The windows are gorgeous, there is a lot to love in Paris. Oh yes! Paris is my all time favourite city! In bookplates, it is unbelievable. In person, I can’t begin to imagine the effect. Way, way more impressive George! This doesn’t begin to do it justice! Wow, these are spectacular! Such intricate and detailed design. Enjoyed your photography and pleased to meet you.Best wishes. Thank you Blazing trail and pleased to meet you too 🙂 thought I was already following you! What stunning stain glass!! wonderful!! Wowww. I gasped in awe just at your beautiful photos! I can’t imagine how stunning they must be in person too. & U HAVE A WONDERFUL BLOG HERE… TRAVEL PURIFIES THE MIND & REJUVENATES IT… WINDERFUL PHOTOGRAPHER TOO U R.. Thank you for that overwhelming endorsement 😀 Pleased to meet you Rose! Oh, the glory of stained glass, Madhu. Perfection. Isn’t it? Wish I had more time to enjoy them though. Time just seems to fly in Paris! Splendid windows indeed – I can relate to the scale of splendor by your narrative – it must be breathtakingly beautiful. It truly is sublime Lynne! Even more so if you could catch a concert there! Doubt there can be any disagreement on the splendour of that stained glass! The concert must have been sublime! We went at the wrong time of year unfortunately. Not half as controversial Frizz 🙂 Though I still don’t see what all that nastiness was about! Imagine going to a concert there at twilight, Mozart’s Requiem, everything lit by candlelight. Oh, That must have been sublime! Thank you for the comment. They are such beautiful stained glass windows. They must have looked incredible in the daytime! They were absolutely unbelievable Meg! My husband and I went to a concert there at night, as well. Was amazing listening to the music of Vivaldi and Borodin. Such a beautiful beautiful place and wonderful acoustics. Spectacular . Indeed it is a house to worship and be inspired. It truly is Island Traveler! Thank you. thank you for posting this! I was at Sainte Chapelle many years ago and my photos (slides actually) are long gone. I was amazed and awe struck by these windows and their history. I can relate to that Lynne! I have lost most of my (mainland) Greece and Andalucia photos. Beautiful photos. I haven’t visited Sainte Chapelle, but I have been to Notre Dame. Next time in Paris, I hope I’ll get to go there to see the Crown of Thorns. The crown is now in the Notre Dame Judy. But you should still go just for the stained glass and maybe catch a concert there! Great entry! stunning and splendid art work!